‘Lao Tzu was the most important spiritual Chinese sage. His name, which is also often called Laozi, literally means “Old Master” and is generally considered an honorific. 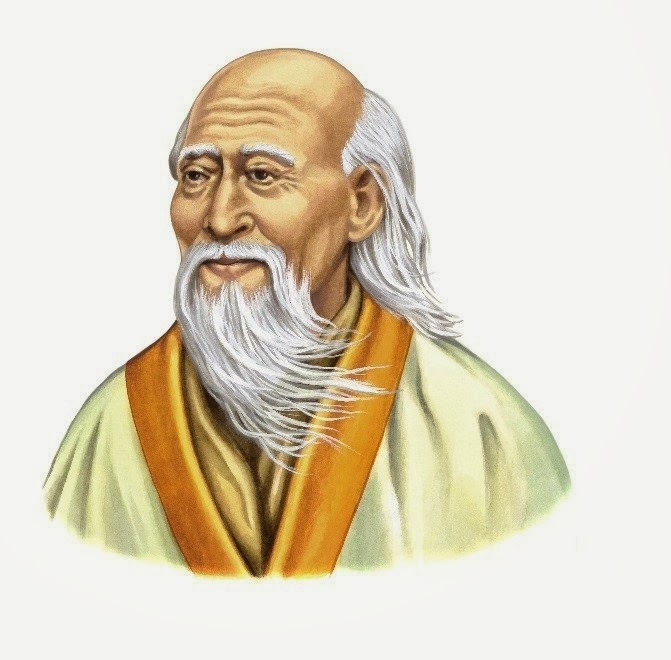 ‘Lao Tzu is the father of the Chinese spiritual tradition Taoism, mainly because of his text called Tao te Ching (Tao: the way of all life, te: the fit use of life by men, ching: text or classic). ‘It is based on the Tao (The Way), which is the creator and sustainer of all things in the Universe, and the practice of doing by nondoing (wu-wei) that enables the disciple to unite with the Tao. ‘The Tao Te Ching is somewhat like the Bible: it gives instructions (at times vague and generally open to multiple interpretations) on how to live a good life. It discusses the “Dao,” or the “way” of the world, which is also the path to virtue, happiness, and harmony. This “way” isn’t inherently confusing or difficult. Lao Tzu wrote, “the great Dao is very even, but people like to take by-ways.” In Lao Tzu’s view the problem with virtue isn’t that it is difficult or unnatural, but simply is that we resist the very simple path that might make us most content. ‘In order to follow the Dao, we need to go beyond simply reading and thinking about it. Instead we must learn wu wei (“flowing” or “effortless action”), a sort of purposeful acceptance of the way of the Dao and live in harmony with it. This might seem lofty and bizarre, but most of Lao Tzu’s suggestions are actually very simple. ‘First, we ought to take more time for stillness. “To the mind that is still,” Lao Tzu said, “the whole universe surrenders.” We need to let go of our schedules, worries and complex thoughts for a while and simply experience the world. We spend so much time rushing from one place to the next in life, but Lao Tzu reminds us “nature does not hurry, yet everything is accomplished.” It is particularly important that we remember that certain things—grieving, growing wiser, developing a new relationship—only happen on their own schedule, like the changing of leaves in the fall or the blossoming of the bulbs we planted months ago. ‘When we are still and patient we also need to be open. We need to be reminded to empty ourselves of frivolous thoughts so that we will observe what is really important. “The usefulness of a pot comes from its emptiness.” Lao Tzu said. “Empty yourself of everything, let your mind become still.” If we are too busy, too preoccupied with anxiety or ambition, we will miss a thousand moments of the human experience that are our natural inheritance. We need to be awake to the way light reflects off of ripples on a pond, the way other people look when they are laughing, the feeling of the wind playing with our hair. These experiences reconnect us to parts of ourselves. ‘Nature is particularly useful for finding ourselves. Lao Tzu liked to compare different parts of nature to different virtues. He said, “The best people are like water, which benefits all things and does not compete with them. It stays in lowly places that others reject. This is why it is so similar to the Way (Dao).” Each part of nature can remind us of a quality we admire and should cultivate ourselves—the strength of the mountains, the resilience of trees, the cheerfulness of flowers.